If you are a qualified electrician, steel structural technician or communications technician, this is the place for you. Even if you are unable to furnish a certificate of completed training, it may be a sufficient entry requirement if you can prove that you have several years' experience in the field. 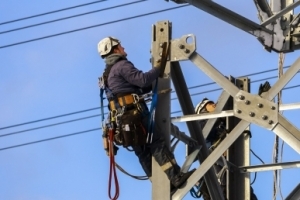 To simplify your development process, we offer you further training, leading to the qualification of IHK Specialist Overhead Lineman; this will give you the thorough technical knowledge you need for working as a lineman for overhead line construction at Cteam. After several years of experience on the premises or in the department, we make it possible for a talented lineman to become a group leader with employee responsibility, a senior lineman with team responsibility, or even a route construction manager or senior site manager. Above all in the responsible position of the senior site manager, we are looking for employees with many years of experience. Construction project managers and client advisers must not only demonstrate a considerable understanding of the underlying technical principles but they must also possess the necessary commercial skills. As a construction project manager, you will be working at and for the construction site, planning and controlling the implementation of projects. As a client adviser, you will work in a sales context both at the company site and at the client's premises, in the acquisition and implementation of projects. In both cases, what we need are employees with a technical qualification or university studies and professional experience. If you have you undergone training as a draughtsman (structural engineering) or in another comparable profession, you may in a few years be able to work as a planner. Subsequent gradual career promotions would lead to a design engineering position, followed after several years of practice in the field of mobile telephony by promotion to planning project manager. Draughtsman or similar training is sufficient for a planner to become a member of the technical staff. If you would like to climb the career ladder as a technician at Cteam, to become a project manager or even take on overall responsibility as a client adviser, we need practical knowledge we can trust. Thorough knowledge of the installation and construction field would benefit you in the organisation of complex construction sites and associated projects. However, if you have completed your higher education, it will make it all the more easy for you to move to the position of overriding client adviser – in a sales capacity directly with the client. Years of experience in the field of mobile telephony also counts for a lot, however, and is accordingly of great value in responsible positions. Whether you begin your training with us as a draughtsman or you enter the company having completed your professional training as a draughtsman or technical drawer, you fulfil the necessary requirements allowing you to offer your skills to either our line planning or design engineering departments. As you gain professional experience in our specific field and develop your specialist competence and independence, you may be able to consider the possibility of advancing to the position of technical planner, line planner or design engineering. Besides performing complex and sophisticated tasks, your duties will also include supporting the training of new employees. If you also have above average organisational and communication skills, a further possible step in your professional development would be to assume overall site responsibility. The ultimate position of head of department represents the uppermost control level of the department and entails disciplinary employee management and cost responsibility. With a degree in the civil or construction engineering field, you can enter our company as a project engineer in the structural analysis or probabilistic calculation department. Similarly, the entry requirements for the line planning department is a degree in surveying. The project engineer performs technical and operational project duties. With appropriate development of your specialist skills and commensurate experience in project execution, you can progress to performing project management tasks. Here you will augment technical activities with query-based calculations and project control. The ability to work in a structured and communicative manner is the basic requirement of success in what is a highly responsible task. If this is a characteristic that you take for granted in yourself, then the addition of site responsibility is a further possible step in your professional development. With many years of professional experience and successful, multidisciplinary competence development, you will ultimately be in possession of the skills necessary for assuming the position of head of department. We require employees with technical professional training and several years of practical experience for our technical machinery department, whose duty it is to lay mobile site access roads. Our installers also work simultaneously as drivers, to enable them to perform orders independently throughout Germany. As a project coordinator, you are not only technically skilled but you also able to assume project control and employee management duties. With many years of practical knowledge, marketing skill and commercial knowledge, you will subsequently be able to assume the position of project manager for mobile site access roads.